The life of Vito Volterra, one of the finest scientists and mathematicians Italy ever produced, spans the period from the unification of the Italian peninsula in 1860 to the onset of the Second World War—an era of unparalleled progress and unprecedented turmoil in the history of Europe. Born into an Italian Jewish family in the year of the liberation of Italy's Jewish ghettos, Volterra was barely in his twenties when he made his name as a mathematician and took his place as a leading light in Italy's modern scientific renaissance. By his early forties, he was a world-renowned mathematician, a sought-after figure in European intellectual and social circles, the undisputed head of Italy's mathematics and physics school—and still living with his mother, who decided the time was ripe to arrange his marriage. When Italy entered World War I in 1915, the fifty-five-year-old Volterra served with distinction and verve as a lieutenant and did not put on civilian clothes again until the Armistice of 1918. By 1925, he was president of the world's oldest scientific society, the Accademia dei Lincei, the founder and president of Italy's National Research Council, a mentor to the brilliant and restless Enrico Fermi, and “Mr. Italian Science” to the rest of the world. But none of this was enough to keep the government of Benito Mussolini from stripping him of all his honors and affiliations in 1931, when he was one of only twelve professors in the entire country to refuse to sign an oath of loyalty to the Fascist regime. This book, based in part on unpublished personal letters and interviews, traces the extraordinary life and times of one of Europe's foremost scientists and mathematicians, from his teenage struggles to avoid the stifling life of a “respectable” bank clerk in Florence, to his seminal mathematical work—which today influences fields as diverse as economics, physics, and ecology—and from his spirited support of Italy's scientific and democratic institutions during his years as an Italian Senator, to his steadfast defiance of the Fascists and Mussolini. In recounting the life of this outstanding scientist, European Jewish intellectual, committed Italian patriot, and devoted if frequently distracted family man, The Volterra Chronicles depicts a remarkable individual in a prodigious age and takes the reader on a vivid and splendidly detailed historical journey. Undergraduates interested in history and the history of mathematics. Goodstein gives a careful and detailed account...[the book] also offers an interesting portrait of family life. The Volterra Chronicles is different from these other works in that it is a dedicated biography of Volterra, based on original documents, which invites us into the mathematician's intimate circle. ... Author Judith Goodstein captures the human, political and social environment of the age. This carefully documented biography by California Institute of Technology archivist Goodstein provides a vivid, very readable depiction of the whole of Volterra's life... Overall, a fascinating, intimate portrait. Highly Recommended. (This book) is a delightful read for anyone interested in the history and culture of mathematics, no matter what their level of mathematical background. ... With skill and clarity, the author weaves together the various cultural and historical strands in the life of Vito Volterra. In the process of recreating the life of this 'extraordinary mathematician', Judith Goodstein has given us a very vivid account of the rich nature of applied mathematics in Italy - and its connections with the most eminent European mathematicians of the day. As well as being a work of serious scholarship, its readability and scope of its thematically diverse narrative mean that should appeal to a wide readership. ...interesting, carefully written, richly detailed history of (Volterra's) personal life and times in which he lived. ...for an outstanding account of the life and times of Volterra this is the biography to read. This book contains a wealth of information about Vito Voltera and his life. The book provides a very readable account of scientific community and Italian history and politics in the 19th and 20th century. 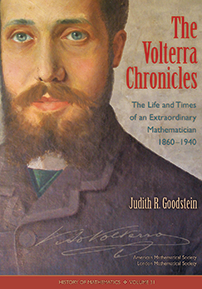 Judith Goodstein has written an extraordinary well-researched and readable biography of the Italian mathematician Vito Volterra. ...beautiful and captivating... well-written... Notable studies on Volterra and his times have been published recently in Italy, as Goodstein acknowledges in her selected biography. However, the present volume is one of the few sources in English. It is also one of the (too) few biographies of remarkable Italian mathematicians of post-unification Italy. It is to be hoped that Goodstein's book will inspire more work in this direction by historians of science in general and of mathematics in particular.